The World's Easiest to Install Camera? 8 cameras installed in 5 minutes. That's the claim of loss-prevention niche surveillance provider USS. The company recently bombarded the NRF-LP show with advertisements claiming world record installation times. In this note, we examine those claims and dig in to see where hype and fact diverge. This sign was featured in several prominent places outside the show floor, and was even featured on the back cover of the bound NRF-LP Expo guidebook. It is vague on details, but makes the direct claim to reduce camera installation time to mere seconds per camera. Needless to say, the ad was successful in generating show floor buzz. Suggesting that this product can shave hundreds of dollars off the cost of installing CCTV systems is no small claim. But does reality back it up? Or is this classic marketing pomposity at work? We stepped in to the USS booth and dug deeper. The uniqueness of the unit is that not only can it be directly powered from high voltage 120 VAC light rails, it also wirelessly connects to USS' companion NVR unit. 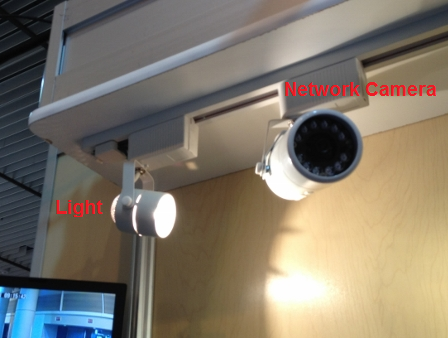 This results in the 'installation in under 1 minute per camera' claim - the idea is that the camera can snap into the light rail and then auto-negotiate with the head end NVR for instant recording. 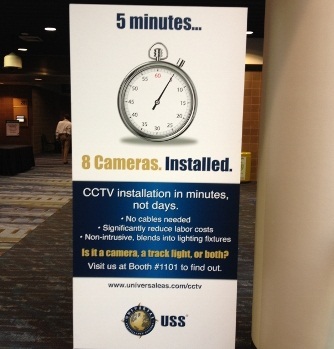 USS is working on a 2 MP model, ONVIF compliance, and 3rd Party VMS integration. Quick Install: While we do not doubt that installation of these cameras are quicker than typical 'wired' cameras, the claim that 'installation takes less than a minute' is dubious and smacks of a cheap publicity stunt. The platform likely requires the use of USS's NVR and a wireless network configured in a specific way - important assumptions for typical deployments. Given that this product will be more expensive compared to traditional cameras, and video system installation commonly requires POS integration/configuration labor, building the value proposition of this camera around speedy installation seems misplaced. Unless the retailer is installing this product themselves, we do not expect the speed of install to reduce the 'bottom line' deployment cost compared to more flexible products. The labor savings claim is especially confusing when the 'covertness' of the camera, designed to look like a track lighting fixture, is not addressed by any marketing literature. Power: Considering the camera can only be mounted in areas where existing tracklighting rails are available, it cannot be deployed as a 'general purpose' surveillance camera and limits it to specialty use. In essence, the camera features a proprietary power connector and mounting plate that prevents installation anywhere but light track rails. Network: Because it is dependent on using WiFi to communicate with the recorder, an 'unseen' limitation of deployment is the range of existing wireless networking. Given the general purpose/cheap wireless routers employed by many retailers, adding MP wireless cameras to the available bandwidth may prove to be a significant constraint. The camera cannot provide live views unless a wireless network is present, and the expansion or addition of a WiFi network for the sake of a single camera may ultimately prove to be more expensive that deploying a traditional 'hardwired' camera. [UPDATE] The manufacturer explained that during test installations, they have deployed rack-power WiFi network repeaters on the camera rail with success in area with weak wireless coverage. Easy to Move: The manufacturer suggested that "When the user has this system and their end caps change because of seasonal product changes, different traffic analysis (can be) done to capture more eyes on the product. " This remark suggests that because this camera is quickly moveable and 'up close', it can be used to collect impressions on the effectiveness of merchandising displays or product placement in a way that general surveillance cameras cannot. Power: A reader pointed out the vulnerability of cameras being turned off when the accompanying lights are turned off. Unless the retailer chooses to leave certain lights powered on a continuous basis, the camera is not up to record activity. We asked USS about this limitation, and they responded by explaining they are in the early stages of designing a battery power pack that accompanies the camera on the light rail. The 'StealthTracker' camera provides a different approach to surveillance, most likely to be appreciated by users who want the cameras to be as covert as possible or who want the flexibility to move their cameras around without having to call an installer. If and when USS gets third party support, it could be a useful complement and addition for retailers that value these two attributes.